Every one of our products contains 250mg of sustainably sourced DHA & EPA omega 3s, essential fats that support heart and brain health. 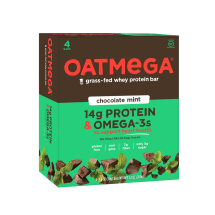 So regardless of your health goals, Oatmega helps fuel your body and your mind. Snack with confidence, knowing that your snack choices are making a positive difference in your life. Grass-Fed Whey Protein (Whey Protein Concentrate, Whey Protein Isolate), Chicory Root Fiber, Gluten-Free Oats, Organic Dark Chocolate (Organic Sugar, Organic Chocolate Liquor, Organic Cocoa Butter, Organic Soy Lecithin, Organic Vanilla), Organic Tapioca Syrup, Vegetable Glycerin, Organic Sunflower Oil, Almond Butter, Responsibly-Caught Fish Oil (Anchovy, Sardine, Tilapia), Cocoa Powder, Natural Flavors, Sea Salt, Sunflower Lecithin, Tapioca Starch, Monk Fruit Extract.